The first warm, sunny days of spring have me looking out the window a bit dismayed – my garden that I carefully cultivated all summer long looks a bit worse for wear. Apple trees need pruning, grass has overtaken the flower beds and some plants did make it through the winter. It’s tempting to just jump out there and get started, but that can spell trouble for my back, which, let’s face it, was pretty sedentary all winter long. Whether you are an old-pro at yardwork, or thinking that this year you will finally learn how to garden, protecting your back should be at the top of your list. After all, plants can be replanted, but you only get one spine. Drs. 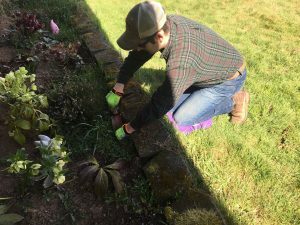 George and Stefanie Olar at 360 Chiropractic in Lacey want to share some helpful tips to maintain spine and overall body health while you prepare your yard for spring. Take Breaks. I swear the term “back-breaking” came from working on the land. There is nothing easy about pulling weeds, digging holes for plants, pruning trees or creating pathways. “We recommend a break every 20-30 minutes of gardening,” says Dr. George. So, take a break, sit on the porch, and admire all the work you have done. It’s a great time to rehydrate with water too! Practice Smart lifting. “When doing repetitive lifting and bending, bend with your knees and do a squat keeping your back straight and using both hands,” shares Dr. Stefanie. “For heavier items use a wagon or cart for assistance.” If you can’t safely lift it into the wagon, get help. Better to ask for assistance than to throw your back out, which will keep you away from your spring projects for a long time. Protect Those Knees. 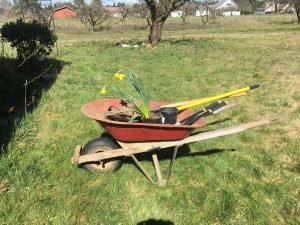 Gardening is hard on more than just your back, your knees can take a lot of pressure when you are down in the dirt. “If you will be kneeling at ground level, a good option is adding cushioning with the use of knee pads,” suggests Dr. George. Stay Hydrated. We mentioned above to drink some water during your breaks. “Keep a water bottle with you while working in the yard and drink often,” the Olars note. Staying hydrated helps your body keep going in the heat. Change it up. “Switch activities that adjust your posture to reduce risk of repetitive motion injuries,” says Dr. George. So do a bit of weeding, then stand up and dig a hole or prune some branches, then go back to weeding. This will help your body not get over worked in any one area. So, go ahead and plant that award-winning garden, just be sure to take care of yourself. If you over do, contact Drs. George and Stefanie Olar to get yourself put right again. I know I wouldn’t be gardening if it wasn’t for the great work they do keeping pain away while bringing function back. To schedule an appointment or to learn more, visit the 360 Chiropractic website. 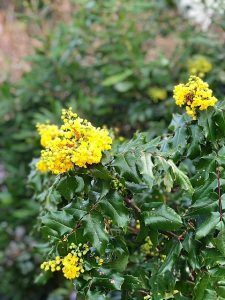 Sore muscles after yardwork? Ask them about their massage therapy! Spring is also a time for new beginnings, and for one Lacey family, they are hoping this year will be the year they will finally get back into a home of their own. Two-and-a-half years ago the Van Winkles had to leave their home and everything they owned, because toxic black mold had caused their daughter Sophia, to become deathly ill with PANS disorder. The house had been sold to them with the mold undisclosed, the inspector at the time of purchase had not done due diligence, and lawyers would not help them. They were out a house and out of luck. The Lacey Firefighters Charity has started a fund called “Sophia’s Hope” for a new house to meet her medical needs. All donations to this fund are501 (c)(3) tax-deductible. To donate, visit the Mold2Miracle website. Thanks to a very generous anonymous donor all donations made from now until April 15 will be matched, up to $50,000. Monday – Thursday: 9:00 a.m. – 12:00 p.m. and 2:00 p.m. – 6:00 p.m.